Plenty of misinformation is still being spread on the Internet regarding the DREAM (Dry Eye Assessment and Management) study that claimed fish oil is not good for dry eyes. Readers who found themselves poring over these click-bait headlines were misled, and their misunderstanding was further perpetuated by the omissive messaging by the New England Journal of Medicine regarding the findings from the National Eye Institute study. Not only was the DREAM trial not well designed or controlled in its broad, inclusive subject selection, the researchers also permitted concurrent dry eye therapies. Additionally, the active Omega-3 supplement used was tested against a placebo, olive oil, which also happens to be a healthy oil. The research concluded there was significant improvement in dry eye symptoms in both the placebo and in the fish oil supplement groups, but that there was no significant difference between the two groups. Wouldn’t that imply that an increase in healthy oils, such as that found in fish oil and olive oil, can significantly help dry eye symptoms? Yet, the lead researcher in the DREAM study, without noting that the placebo is also a healthy oil, said that fish oil is not effective in improving dry eye symptoms when his own research clearly indicates that it is. Fish oil and olive oil both help reduce dry eye symptoms. “The Omega-3 used (in the study) was a fish oil concentrate in triglyceride form, rather than re-esterified triglyceride, which may help to shed light on the findings,” says Dr. Richard L. Maharaj from eyeLABS in Brampton, ON. Although the study had many blemishes, the conclusions did illuminate other alternatives to consider in the treatment and management of dry eye disease (DED). “Interestingly, the name DREAM is appropriate, in that seeing the impact of the olive oil may point us to seek out other naturally existing oils and their impact on the ocular surface,” says Dr. Maharaj. Before jumping into what healthy oils to consume, it is important to first know about Omega-3, -6 and -9 fatty acids. The body cannot produce the essential dietary fats Omega-3 and -6, and so these must be consumed. These fats are part of a family of polyunsaturated fatty acids called PUFAs, including DHA, EPA, DPA, and linoleic acid. Omega-3 helps balance pro-inflammatory Omega-6. Also, Omega-3 fish oils come in triglyceride or ethyl ester forms. Triglycerides are the natural form of Omega-3 in fish and do contain impurities. The more expensive, re-esterification process converts the artificially manufactured ethyl ester form without impurities back into the natural form of Omega-3. Omega-9 are monounsaturated and are not deemed essential because they are already produced by the body. All EFAs treat cells as miniature cities with signaling systems between the cells. They make up part of the protective cell membrane, especially Omega-3 which allows nutrients and wastes to go in and out of the cell. Not consuming enough healthy oils or consuming too much creates a traffic jam which won’t allow oxygen to pass through properly. This reduction in oxygen causes the normally paired oxygen molecules to gain electrons, thus turning them into unpaired molecules called free radicals. Cellular injury and damage occur when free radicals build up at the cellular level, and the communication system between the cells becomes erratic and causes inflammatory disease, such as cancer, heart disease and arthritis. These inflammatory conditions can contribute to dry eyes, which in turn can cause more inflammatory reactions on the ocular surface. It is important to treat dry eyes as the symptom. Because eyedrops are for symptom-relief and don’t fix the problem, it makes sense to treat the inflammation within the body to help get rid of dry eye by consuming healthy oils. A shift in lifestyle diet, added to a body wellness regime will help with dry eyes. Omega-3 and -6 fatty acids are the building blocks of healthy cell membranes and healthy cells in general. The recommended ratio of Omega-6 to Omega-3 is 2:1 or 4:1, not the 10:1 we often see in Western diet. The Mediterranean diet, which uses large amounts of olive oil, is excellent for those with dry eye. Eating healthy oils creates better traffic flow between cells, which prevents free radical build-up. Healthy oils help to clean out the bad cells and sometimes even repair them. “Certainly, the DREAM study adds to our new collective approach to managing DED using a comprehensive approach which includes nutrition counselling, ” says Dr. Maharaj. 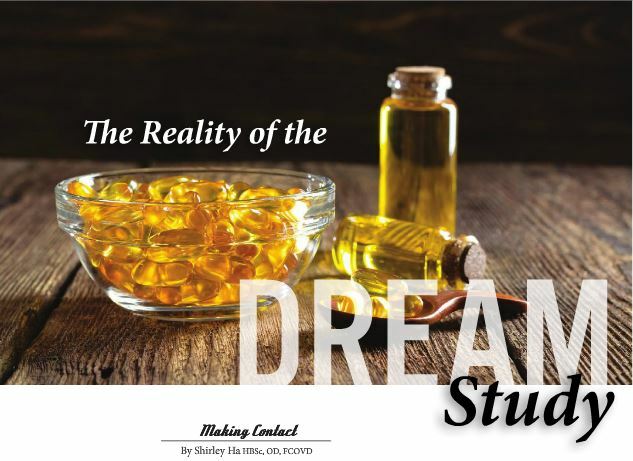 The DREAM study, albeit flawed, shows that Omega-3 supplementation is beneficial while shining a bright light on the need to look more closely at other healthy oils as well.